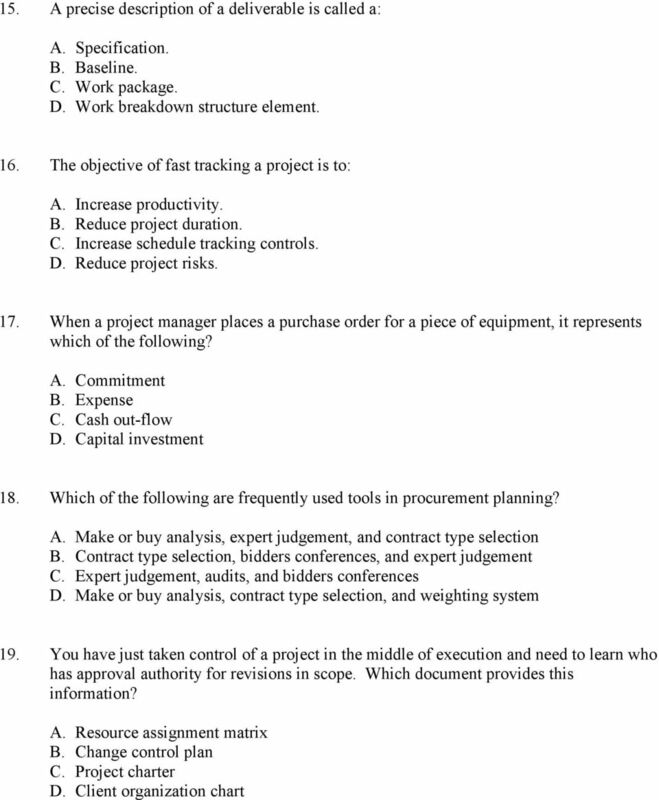 1 Sample Examination Questions The following questions are examples of the type of questions that appear on the PMP Certification Examination. Disclaimer: These questions are intended for study purposes only. 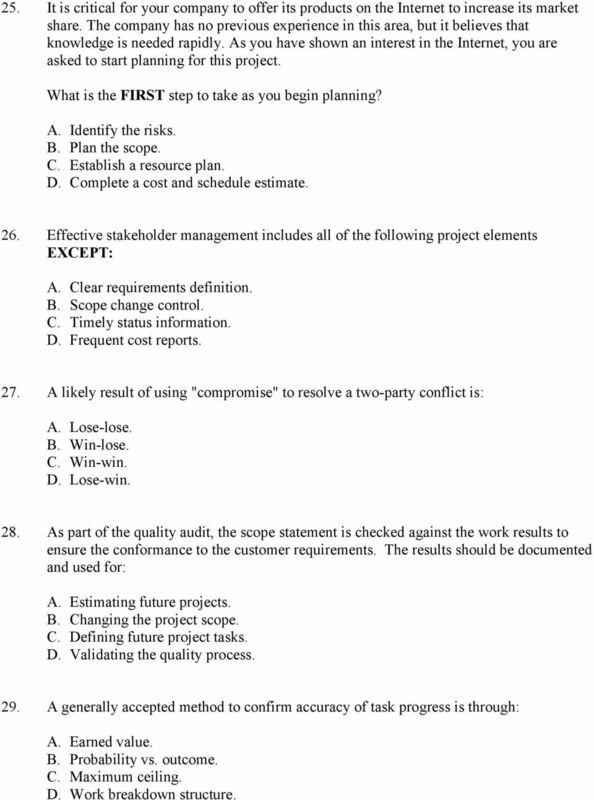 Success on these questions is not indicative of success on the Project Management Professional Certification Examination. This download of the Sample Exam Questions is for your personal use and NOT FOR commercial use. Any unauthorized use or duplication of this document is prohibited! 1. The MAJOR processes for project integration management are: A. Project plan development, project plan execution, and overall change control. B. Project plan development, project plan execution, and scope change control. C. Project plan development, overall change control, and scope change control. D. Project plan development, initiation, and overall change control. 2. Project sponsors have the GREATEST influence on the scope, quality, time, and cost of the project during the: A. Concept phase. B. Development phase. 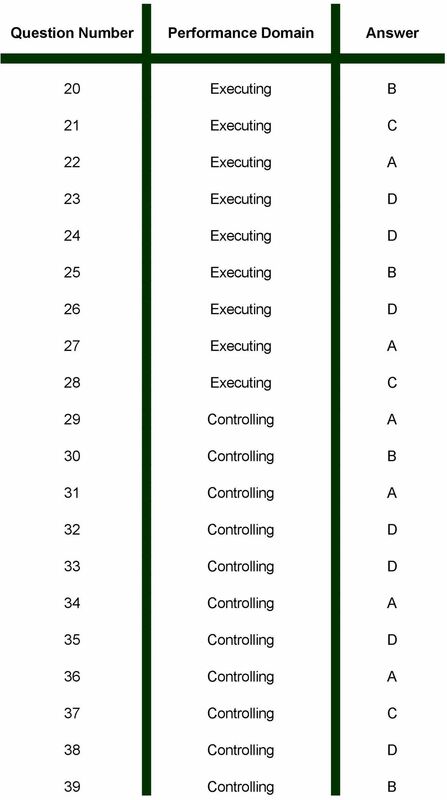 C. Execution phase. D. Close-down phase. 3. Ideally, communication between the project manager and the project team members should take place: A. Via daily status reports. B. Through approved documented forms. C. By written and oral communication. D. Through the formal chain of command. 4. A project's payback period ends when: A. Profit maximum is realized. B. Unit profit is realized. C. Monthly revenue exceeds monthly costs. D. Cumulative revenue equals cumulative costs. 2 5. A scope statement is important because it: A. Provides the basis for making future project decisions. B. Provides a brief summary of the project. C. Approves the project for the stakeholders. 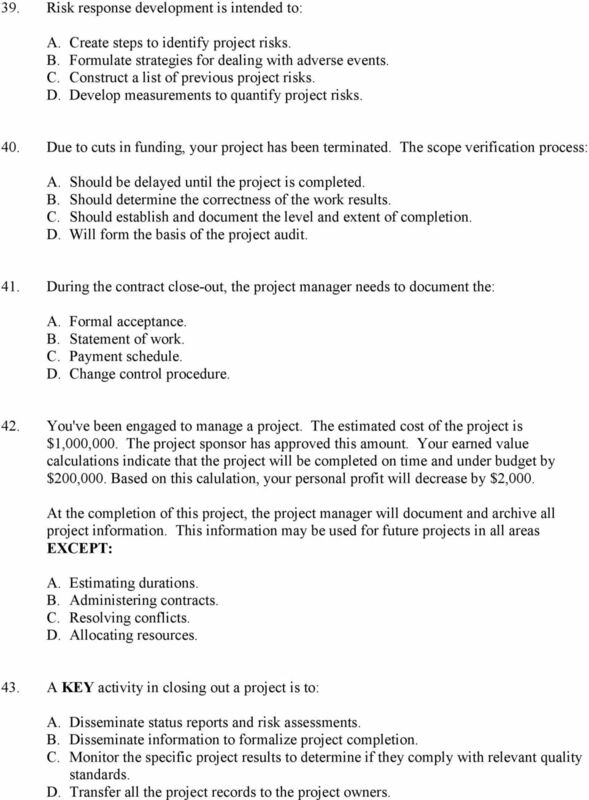 D. Provides criteria for measuring project cost. 6. A project management professional can compare earned value performance data to all of the following project management tools EXCEPT: A. Critical path analysis. B. Technical performance metrics. C. Risk mitigation plans. D. Forecasted final costs and schedule estimates. 7. 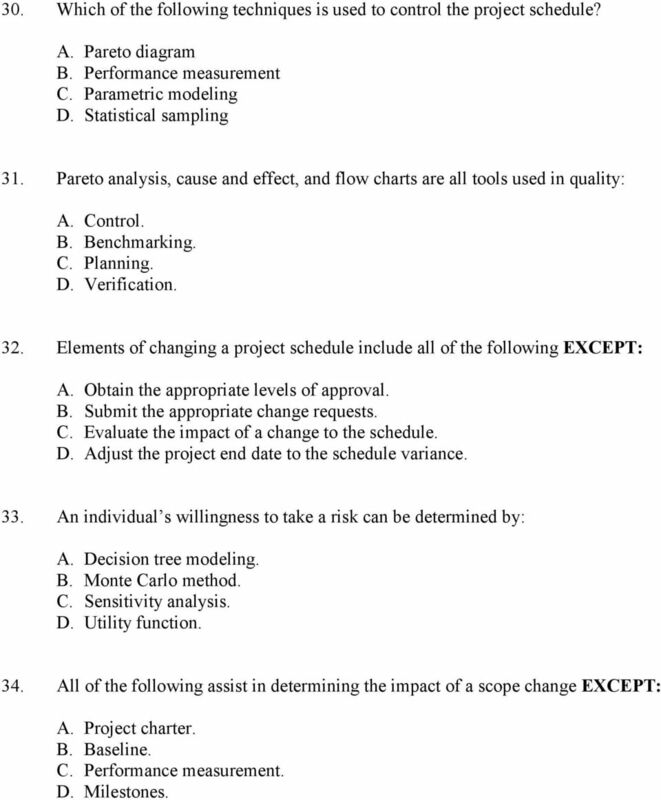 During the project scope planning process, the work breakdown structure should be developed to: A. The sub-project level. B. 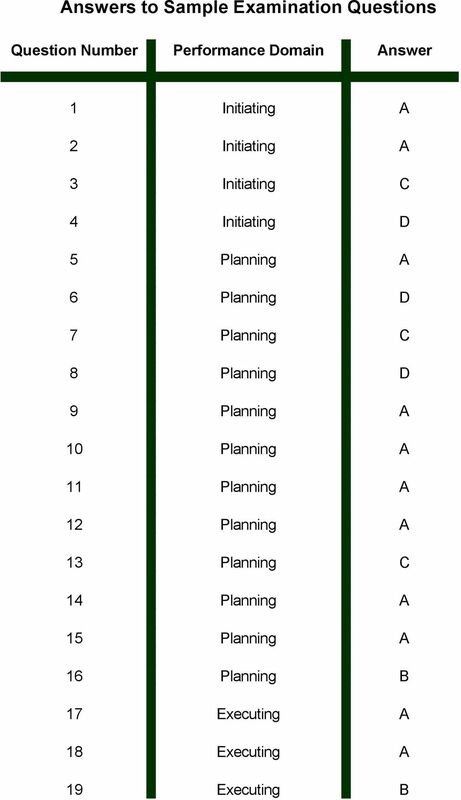 The level determined by the project office. C. A level allowing for adequate estimates. D. The cost center level. 8. The decomposition process is a technique used to construct a: A. Precedence network. B. Critical Path Method Diagram. C. Variance analysis. D. Work breakdown structure. 9. A project loses a contractor in the middle of a project. A new project team is formed to replace the role of the lost contractor and his/her team. As a project manager, what is the FIRST topic to address to the team in the kick-off meeting? A. Identify team roles and responsibilities. B. Review detailed schedule. C. Discuss cost estimates. D. Emphasize your authority. 5 20. Of the following conflict management approaches, which is believed to lead to the LEAST enduring positive results? A. Problem solving B. Avoidance C. Compromise D. Forcing 21. Complex projects, involving cross-disciplinary efforts, are MOST effectively managed by: A. Multiple lead project managers. B. A functional organization. C. A strong matrix organization. D. A strong traditional manager. 22. 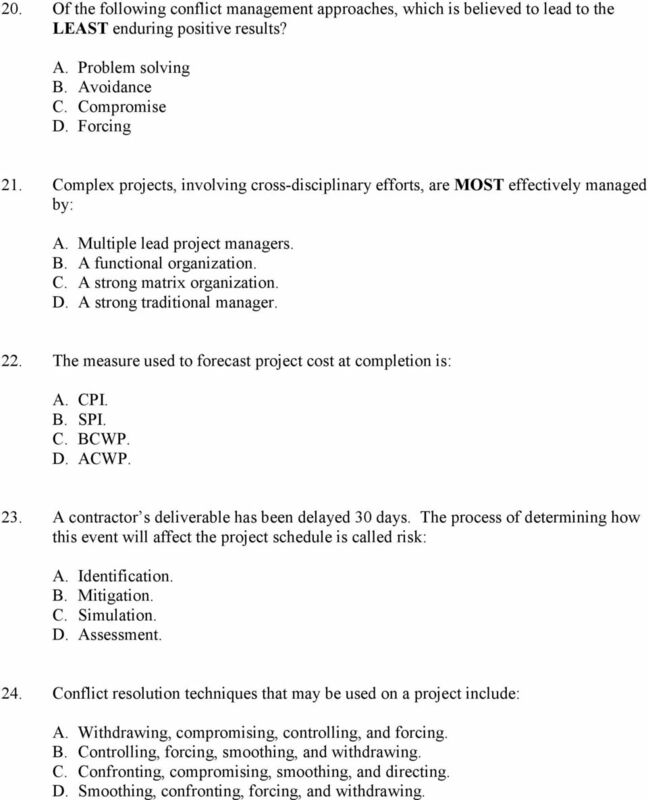 The measure used to forecast project cost at completion is: A. CPI. B. SPI. C. BCWP. D. ACWP. 23. A contractor s deliverable has been delayed 30 days. 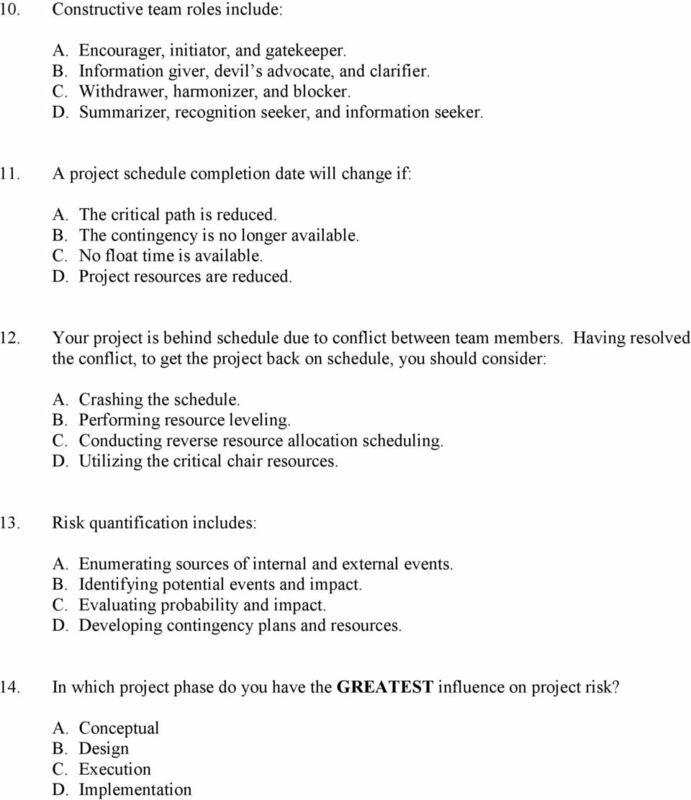 The process of determining how this event will affect the project schedule is called risk: A. Identification. B. Mitigation. C. Simulation. D. Assessment. 24. Conflict resolution techniques that may be used on a project include: A. Withdrawing, compromising, controlling, and forcing. B. Controlling, forcing, smoothing, and withdrawing. C. Confronting, compromising, smoothing, and directing. D. Smoothing, confronting, forcing, and withdrawing. 6 25. It is critical for your company to offer its products on the Internet to increase its market share. The company has no previous experience in this area, but it believes that knowledge is needed rapidly. As you have shown an interest in the Internet, you are asked to start planning for this project. What is the FIRST step to take as you begin planning? A. Identify the risks. B. Plan the scope. C. Establish a resource plan. D. Complete a cost and schedule estimate. 26. Effective stakeholder management includes all of the following project elements EXCEPT: A. Clear requirements definition. B. Scope change control. C. Timely status information. D. Frequent cost reports. 27. A likely result of using "compromise" to resolve a two-party conflict is: A. Lose-lose. B. Win-lose. C. Win-win. D. Lose-win. 28. As part of the quality audit, the scope statement is checked against the work results to ensure the conformance to the customer requirements. The results should be documented and used for: A. Estimating future projects. B. Changing the project scope. C. Defining future project tasks. D. Validating the quality process. 29. A generally accepted method to confirm accuracy of task progress is through: A. Earned value. B. Probability vs. outcome. C. Maximum ceiling. D. Work breakdown structure. 7 30. Which of the following techniques is used to control the project schedule? A. Pareto diagram B. Performance measurement C. Parametric modeling D. Statistical sampling 31. Pareto analysis, cause and effect, and flow charts are all tools used in quality: A. Control. B. Benchmarking. C. Planning. D. Verification. 32. Elements of changing a project schedule include all of the following EXCEPT: A. Obtain the appropriate levels of approval. B. Submit the appropriate change requests. C. Evaluate the impact of a change to the schedule. D. Adjust the project end date to the schedule variance. 33. An individual s willingness to take a risk can be determined by: A. Decision tree modeling. B. Monte Carlo method. C. Sensitivity analysis. D. Utility function. 34. All of the following assist in determining the impact of a scope change EXCEPT: A. Project charter. B. Baseline. C. Performance measurement. D. Milestones. 8 35. A project was estimated to cost $1.5 million and scheduled to last six months. After three months, the earned value analysis shows the following: BCWP = $650,000 BCWS = $750,000 ACWP = $800,000 What are the schedule and cost variances? A. SV= +$100,000 / CV= +$150,000 B. SV= +$150,000 / CV= -$100,000 C. SV= -$50,000 / CV= +$150,000 D. SV= -$100,000 / CV= -$150, Configuration management is a technique for: A. Overall change control. B. Project plan execution. C. Scope planning. D. Risk quantification. 37. Scope change control MUST be integrated with all of the following control processes EXCEPT: A. Schedule. B. Cost. C. Procurement. D. Quality. 38. Reviewing work products and results to ensure that all were completed satisfactorily and formally accepted is part of: A. Risk management. B. Quality control. C. Change control management. D. Scope verification. 9 39. Risk response development is intended to: A. Create steps to identify project risks. B. Formulate strategies for dealing with adverse events. C. Construct a list of previous project risks. D. Develop measurements to quantify project risks. 40. Due to cuts in funding, your project has been terminated. The scope verification process: A. Should be delayed until the project is completed. B. Should determine the correctness of the work results. C. Should establish and document the level and extent of completion. D. Will form the basis of the project audit. 41. During the contract close-out, the project manager needs to document the: A. Formal acceptance. B. Statement of work. C. Payment schedule. D. Change control procedure. 42. You've been engaged to manage a project. The estimated cost of the project is $1,000,000. The project sponsor has approved this amount. Your earned value calculations indicate that the project will be completed on time and under budget by $200,000. Based on this calulation, your personal profit will decrease by $2,000. At the completion of this project, the project manager will document and archive all project information. This information may be used for future projects in all areas EXCEPT: A. Estimating durations. B. Administering contracts. C. Resolving conflicts. D. Allocating resources. 43. A KEY activity in closing out a project is to: A. Disseminate status reports and risk assessments. B. Disseminate information to formalize project completion. C. Monitor the specific project results to determine if they comply with relevant quality standards. D. Transfer all the project records to the project owners. 10 44. You've been engaged to manage a project. The estimated cost of the project is $1,000,000. The project sponsor has approved this amount. Your earned value calculations indicate that the project will be completed on time and under budget by $200,000. Based on this calulation, your personal profit will decrease by $2,000. Given the estimated decrease in personal profit, what action should you take? A. Invoice for the full $1,000,000 based on the contract. B. Add tasks to improve the outcome and increase the actual project cost. C. Inform the end-user that you can add features to the project in order to use the entire budget. D. Communicate the projected financial outcome to the project sponsor. 45. You are building a water treatment facility. Routine tests reveal that there are contaminants in the water but that they have an extremely low risk for causing any sickness. As the project manager, you should: A. Inform the public that a detailed examination has been ordered to determine the extent to which the problem exists. B. Do nothing because there is extremely low risk for sickness except for some effects on small children and the elderly. C. Tell the public there is no problem, except for small children and the elderly who need to boil the water before drinking. D. Educate the public about the advances on water treatment technology and the industry efficiency and safety record. 46. A KEY activity for achieving customer satisfaction is to define: A. The business use. B. Requirements. C. Product specificity. D. Change control. 47. When it appears that a design error will interfere with meeting technical performance objectives, the PREFERRED response is to: A. Decrease the performance value to equal the assessed value. B. Develop alternative solutions to the problem. C. Increase the specified value to set a new performance goal. D. Reduce the overall technical complexity of the project. Syllabus 2nd Edition 2 Introductory Certificate Syllabus 2nd Edition 2nd Edition Introductory Certificate syllabus All of the syllabus elements should be taken within the context of a project and project.